My first birth was wonderful and I will always be very grateful for it. But the more I reflected on it afterward, the more I felt I had missed out on something. My epidural was so strong and I felt like I didn’t really experience his birth. I decided that there must be other options—there had to be something in between an epidural birth and screaming, painful natural birth. So I did some research and discovered Hypnobabies. I knew immediately that this was what I was looking for. Trevor thought I had lost it a bit, but after watching some youtube videos he decided it was worth a shot. I think he just decided that it would make me happy and if it totally failed I would be the one in pain, not him!We signed up for our classes and practiced scripts and finger drops every day. I loved listening to my “joyful pregnancy affirmations” and “deepening.” The best naps happen after listening to “deepening.” I wanted to incorporate scripture and prayer into my birth so I would repeat Bible verses and prayers while I was practicing my finger drops. Whenever I went to my special place, the song “Oceans” by Hillsong United would repeat in my head. Especially the verse, “Take me deeper than my feet could ever wander and my faith will be made stronger in the presence of my Savior.” I repeated that as I practiced going deeper into hypnosis. It became the anthem of Griffin’s birth. Trevor had a bracelet made with those lyrics engraved on it for my Mother’s Day present. I wore the bracelet every day and during Griffin’s birth. I was really enjoying the process of preparing for our baby’s birth. Our OB, Dr. West, was totally on board with Hypnobabies and our water birth. But in the middle of my third trimester the Allina hospitals, including Abbott where we were going to deliver, put a ban on water births. I decided that as much as I loved Dr. West, I really wanted my water birth. So at 36 weeks I switched to the midwives at Methodist hospital. My body did a lot of work in those last few weeks. I was having a lot of practice waves every day. At my 37 week appointment the midwife checked me and I was not too surprised to learn I was 3 cm dilated and 70% effaced. Our first came at 38 weeks 6 days so I was preparing myself for an early baby. Then my 38 week appointment came. I was 4.5 cm and 80% effaced, baby was at -1 station. I was convinced that Griffin would be coming any day! The midwife at the appointment mentioned that she didn’t think I would make it to my next appointment, but if I did we could talk about breaking my water to get things going. She didn’t want me walking around super dilated for too long because she was worried he would come too fast. I knew I didn’t want to do have my water broken and I got really anxious. I talked it through with Trevor and our doula, Lindsay, and they both helped me to feel confident in my convictions to let Griffin come when he was ready. I wanted my birthing time to come on its own so I didn’t even have to have that conversation. I continued to have a lot of pressure waves, some of them very intense, but they were inconsistent. I knew my body was working hard, but it just wasn’t ready to go into my birthing time. As the days went on I grew more and more impatient and anxious. I went to acupuncture appointments, chiropractor appointments, and on multiple walks a day. I was getting very uncomfortable and crabby and I was definitely not pleasant to be around. 38 weeks and 6 days came and I was furious! Second babies were supposed to come earlier than first babies! But something changed as soon as that day came and went—I knew this baby was going to come later than our first did and I was suddenly okay with it. All the joyful pregnancy affirmations I had been listening to clicked. This was a new birth and a new baby, unique unto itself. My baby would come at the perfect time. I went from crabby and annoyed to patient and peaceful. I began listening to “Oceans,” “birthing day affirmations” and then “Come out baby” every night before bed. Lindsay suggested that listening to those tracks can sometimes get your body going if it’s on the brink of going into your birthing time. But Griffin still wasn’t ready and I could not believe I made it to my 39 week appointment. Neither could my midwife. I was 39 weeks and 5 days. She started the appointment assuring me that we wouldn’t break waters or talk induction until well after my due date. This was such a relief. 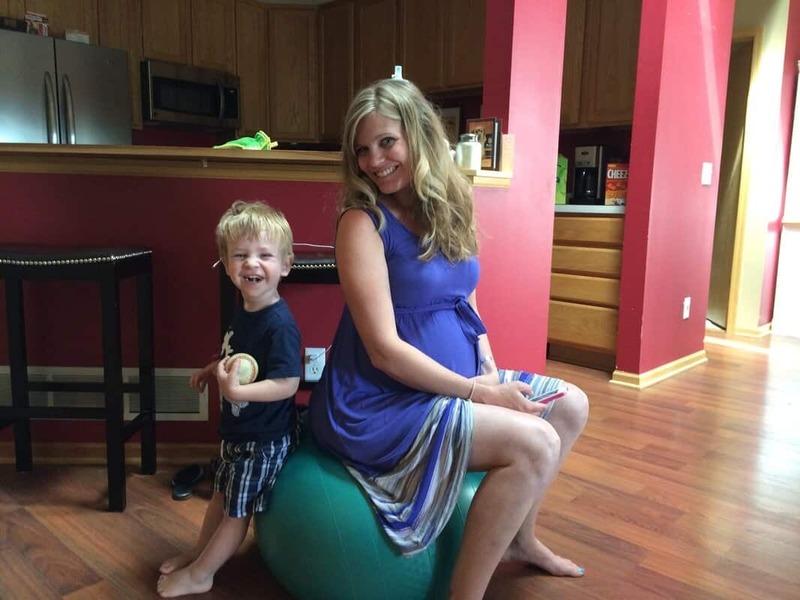 I asked her to check me because at this point it had become a game—how far can I dilate before going into labor. I was 6 cm, completely thinned out, and baby was at 0 station. She actually laughed. She said she could not believe I was still pregnant, especially with all the waves I had been experiencing. She asked Trevor if he was going back to work that day because she thought he should maybe stay home. She told me to go home and put my suitcase in the car and to go to the hospital as soon as anything started feeling consistent or real. She spoke with the hospital and the midwife on call that night so they would be on alert for me. I went home and Trevor went to work to wrap some stuff up. Soon after Calvin went down for his nap I started to feel my waves pick up. They were getting more intense and coming every 5 to 10 minutes, but the intervals varied. I waited awhile and called Trevor to have him come home a little early. My mom came over to watch our son in case we had to leave for the hospital. I called Lindsay to update her on everything. I spent hours sitting on my birth ball, listening to tracks, watching our son play, and listening to my mom and Trevor chat. Eventually my mom took our son back to their house so that we could focus more and leave quickly if needed. Trevor and I ordered pizza and went on walk. I talked to the midwife on call and Lindsay multiple times throughout the evening and kept telling them it just didn’t feel like it was time to come in. I told Lindsay it felt like it was getting real but part of me was waiting for it to start hurting! She had to remind me that I shouldn’t wait for pain since I had been practicing for so long to not feel pain. My waves continued to be intense and regular and then drop off again. I knew baby wasn’t coming so I sent Trevor to pick up our son and I went to sleep. The next day was uneventful. More inconsistent waves, more Hypnobabies tracks, more walks. We had a play date with a friend and I tried to stay busy. I was surprised at how calm I was. I kept telling my sister, who was convinced Griffin was torturing me, that I was patient and content. She didn’t believe me. That night (the night before my due date) I went to bed listening to my usual playlist. It was rainy and stormy as it had been for weeks. I woke up around 1:45 to three intense waves that were very close together. I decided to get out of bed, get dressed, and put some make up on. If my waves continued I would wake Trevor after that. I got through two more waves before I decided to wake Trevor and call Lindsay and my mom. That was around 2 am. My mom came over immediately and Trevor and I left for the hospital at 2:30. I called the midwife on call and told her my waves were 3 minutes apart. She informed me that I couldn’t be admitted! The hospital was flooding and they were starting to lose power so they were not admitting new patients. She asked which hospital I wanted to go to and I told her Abbott. We were at the exit for Methodist when I had to tell Trevor to keep going and that we were going to Abbott. I knew my water birth was not happening after all, but I kept calm and didn’t let it upset me. My waves were really intense and between the car ride, talking with the midwife, and updating Lindsay on our change of plans I was having a hard time staying in hypnosis. I continued listening to “Easy first stage,” and was feeling like I was in my rhythm by the time we pulled into Abbott. I got out while Trevor parked the car. Lindsay wasn’t there yet. I walked in and the woman at the desk asked me to sign some papers. I was working on that when she asked how far along I was. I told her it was my due date and her response was, “oh! Then this could really be it, huh?” I found that to be a really stupid and obnoxious thing to say. Of course this was it, it was 2 in the morning and my waves were three minutes apart. I lost my focus and had one big, painful wave. I stopped with papers, put my headphones back in, went to a chair, and focused on my special place. All felt right again. The nurses brought me straight to my room, got me hooked up to a monitor, and brought me a birth ball. Lindsay arrived then, I was happy to see her but I’m pretty sure I didn’t really acknowledge her. They checked my cervix and I was 8cm dilated (though I asked not to know at the time and was told this afterward). The birth ball was annoying to me at that point and so I spent the rest of the time on the bed leaning over the back. Lindsay turned “easy first stage” on over a speaker and she and Trevor made a phenomenal team. There were several times that I would tense up and Lindsay would use the release or relax cues on me and I instantly fell limp and loose and relaxed. She reminded me to send my peace around Griffin. Trevor was amazing. He was ad-libbing scripts as I needed them and was there to rub my back and hold my hand. He read me Bible verses that I had prepared on note cards beforehand. He did all this while filming everything! I could not have asked for a better birth partner. He was definitely my rock. Transformation was intense, but there was never a moment that I felt I couldn’t do it or that I doubted myself, Griffin, or Hypnobabies. I felt most of the intensity in my back, and there were moments of some discomfort, but I was never in pain. I actually loved the pushing stage. I loved putting my body to use and feeling productive. I pushed when I felt like it and took my time. The whole birthing time had been so fast that I didn’t want to rush pushing. I remember thinking to myself that I wasn’t feeling this ring of fire that everyone spoke of. Instead, I pushed completely pain free! No one would have known though, because I was very loud, but there is so much energy and force going through your body it’s hard to be quiet! I pushed for 35 minutes. 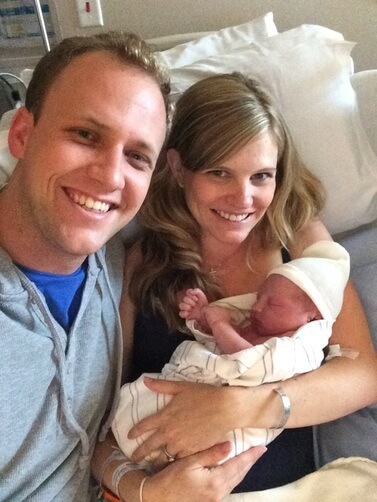 Griffin arrived at 4:19 AM—just under an hour and a half after arriving at the hospital. I reached down and pulled him into my arms. Trevor immediately wrapped his arms around us and prayed over him. I asked him to play “Oceans” one more time while we waited until the cord stopped pulsing before we cut it. I snuggled with my sweet baby for over an hour before we weighed him and did his other newborn procedures. It was the sweetest hour. I loved my birth. I am so grateful that I found Hypnobabies and had the tools to have an easy, comfortable birth. I loved working with Lindsay. I loved how involved Trevor was in the whole experience. I loved that we got to incorporate our faith into his birth. I cannot wait to give birth again; I just honestly hope it’s longer next time so I can ease into it all and enjoy it even more! Could you tell me which verses you used during your preparations and birth? I would to meditate on scripture also.